← February has been a short but busy month . . .
Another productive and busy month at the end of the planning year . . . .
On the 9th March, following our meeting with him in January, James Price CEO of Transport for Wales, as promised, made a site visit to Magor and Undy. James and his colleague, Andrew Bold, wished to fully understand the layout of the rail tracks, footbridges, subway, signals and the proposed positions of the railway platforms. In the picture, James, Andrew and Christian Schmidt can be seen noting the heavy volume of traffic passing by, even though it was not during a rush-hour. Coincidentally, the figures in orange in the background are engineers from Mott MacDonald who were about to make an assessment of the subway, which will need upgrading as part of the station build. We will be maintaining the relationship with Transport for Wales from here on as they will hopefully pick up the implementation of the project once GRIP 3 is complete and we have secured funding from the UK new Station Fund. 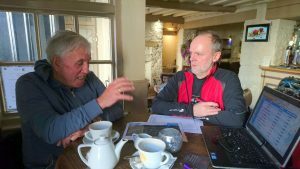 The 19th of March saw me and Ted meeting Gwyn Smith of SUSTRANS for a coffee in The Golden Lion. SUSTRANS is a body that promotes ‘active travel’ (walking and cycling) and integration with public transport to reduce ‘emissions’. Gwyn (on the right of the picture) was impressed with the progress we have made with the station and clearly was intrigued and supportive of the ‘Walkway’ concept which we believe is unique in the UK and possibly establishing a new model for the future. We agreed that MAGOR and SUSTRANS could help each other achieve our aims over the coming months and years and have already started exchanging information. 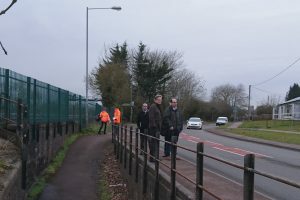 On the 23rd March, after submitting MAGOR’s response to the “Cardiff Capital Region Outline Regional Transport Strategy Stakeholder Consultation” on the 16th of the month, we met Jessica Morden MP to give her an update on progress. Jessica, who is a keen and close supporter of the project, was particularly interested in our recent successes and the progress we have made over the whole year. She agreed with us that we may have something of a ‘new way’ with the Walkway concept and was quick to offer to raise the approach in parliament with the Transport committee or even at Prime Minister’s questions. We are now helping her research assistant with a speech to open the debate. Of course, in the middle of the month we held our usual monthly meeting in the Golden Lion. One of the main topics was the plan for 2018/19 – which will include re-engaging with our local primary schools. This could involve asking the children in both schools to enter a ‘short-story competition’, probably centred around the station campaign and the benefits of active travel. We are grateful to GWR who have already agreed to provide an excellent ‘first prize’. Our plan for 2018 will be published on the website next month. Many thanks for your interest and support through the year.